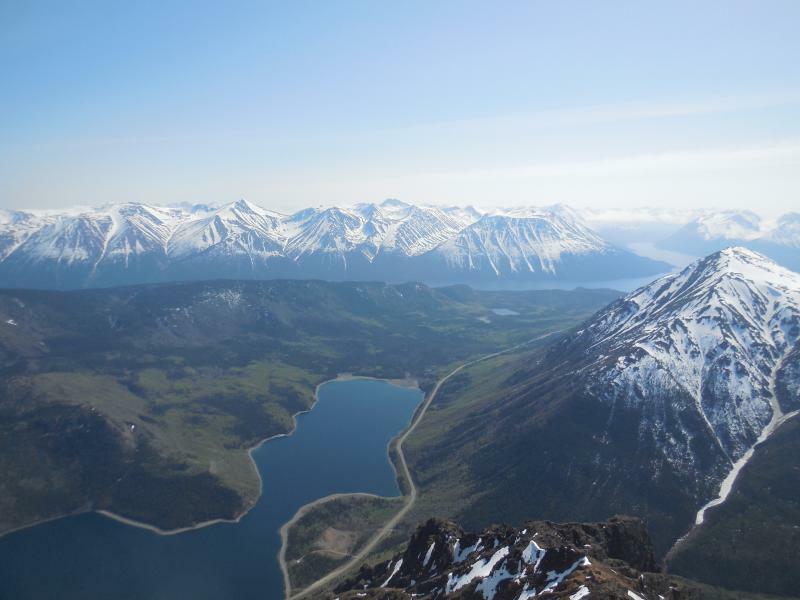 Dail Peak, named after miner George Dail, offers sweeping views down the Klondike Highway above Windy Arm of Tagish Lake. It is connected via a ridge system to Mt. Matheson and eventually to Montana Mountain. 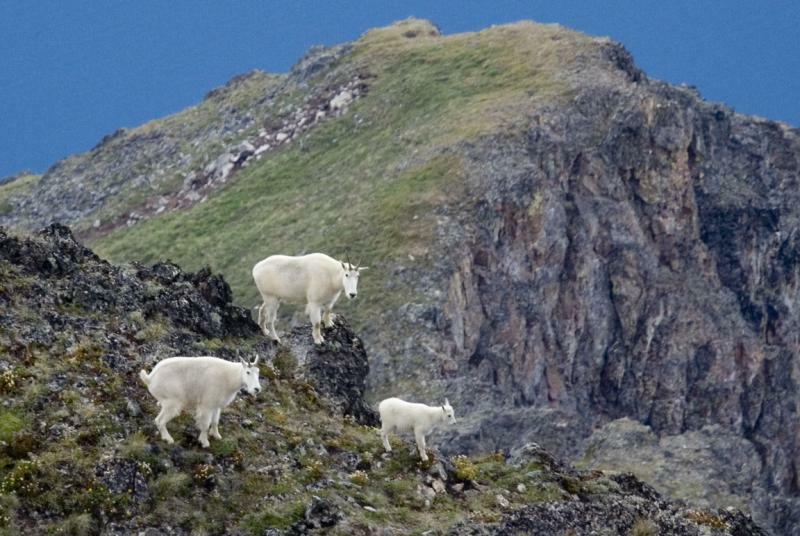 It is the home of numerous Dall sheep and mountain goats. From the top of the ridge, there are tremendous views of the entire surrounding area for miles around. From Whitehorse, drive south on the Alaska Highway until you reach the Carcross Cutof with the South Klondike Highway. Drive south on the South Klondike Highway towards Skagway. After 25 km past the community of Carcross, there is a pullout on the right side of the highway with a yellow gate and a road that leads up the mountain side. Just before the pullout there are old mining structures along the highway. Park at the pullout with the yellow gate. Start up the old mining road and skirt around the yellow gate. Follow the road as it climbs parallel to the highway. At the first fork in the road, where going straight would descend, take the left fork uphill. You will soon come to some mining relics and a small clearing. Walk straight to the very end of the clearing where a less established trail contours uphill. Follow the rough trail, which may have pipes and tubing running towards the gully. The trail stops at the gully. Make your way uphill from here along the goat trail along the ridge. You will follow this ridge for quite a ways up. Shortly you will come to a small rock face on the ridge which you can either climb straight up or skirt around the right side. You will pass through some stunted trees which should have goat paths leading through them. Higher up, look for a somewhat worn goat trail that will cut across your trail. Follow this goat trail to the left (south) as it heads towards Dail Peak. At any time now, pick your way up the open hillside to the top of the ridge. At the top of the ridge, you will overlook a high plateau which is connected to Montana Mountain. Make your way to the left (south) up to the rocky section which will feel like a small false summit. From here, continue along the ridge to the base of Dail Peak. The ridge is broad and has some knarly rock formations on the east side (your left). It is a short hike up to the summit from here. Follow the same trail back. Do not be tempted to descend one of the other gulleys, even though they may look safe and more direct. About three quarters of the way down these gulleys, there are sheer cliffs and waterfalls, which will force you to hike frustratingly back up the way you just came down. It may look promising from the top of the ridge, but will actually take you longer and require a lot of bushwacking if you attempt it. Have you been to Dail Peak lately? Dail Peak is not maintained. The first half of the trail is very steep, and you're hiking mostly on goat trails. When dry, the gravel can be loose, and when wet it can be slippery. It's also easy to get lost on the trail when heading back down, so I recommend using your phone GPS to map a route as you hike up so that you can find your way back down if you lose your path. 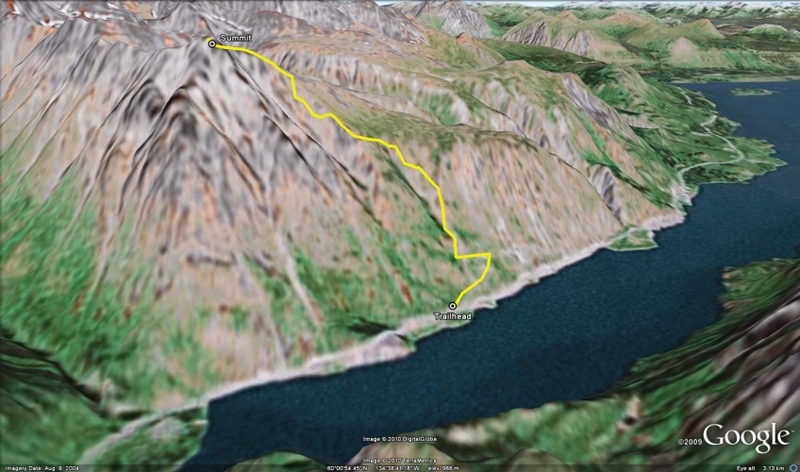 Can anyone that has done the AB mountain hike in Skagway AK compare it to this one? Thanks! Anyone know of established climbing routes on dail peak?? Hiked this route on Sunday, May 7. Intermittent snow patches at higher elevations with a mixed bag of snow conditions. The summit ridge was fully snow covered and basically perfect conditions. 5 hours return trip. Hiked Dail peak today. There's construction on the highway on the section where you would usually park so I had to backtrack east and park in a pullout near the bottom of Pooly canyon around UTM 521616 6654615. I would recommend scrambling up right away above the cliffs that border the road to try to meet the old road as early as you can, just climb high enough that you don't expose yourself to the cliffs and keep traversing SW at about 720m. The road makes for fast and easy travel. Once you get to the old mining ops, go up and follow the ridge, avoiding difficulties on the right. The track on the website is a bit too far west. You do want to follow the ridge just to the right of the drainage but then you also want to hit the ATV track as early as you can as this will also make the hiking easier and faster. The track can be found near UTM 520118 6654200 at about 1320m. Follow this track up until you can see it doing a 180 degree turn around a drainage and follows and start hiking up the ridge from there. The way to the summit following the ridge is obvious and doesn't feel exposed. You could also walk up the drainage from the turn in the ATV track and take a left up the ridge from the saddle. I prefer the ridge both ways for the views. Clouds closed in on me in the summit and I decided to wait it out for about an hour to try to get the views. Definitely a spectacular viewpoint of tagish and tutshi. Amazing hike. The most rewarding I've done in the Yukon, and also the most physically demanding. The advice from Marc (below) was excellent, as intersecting the ATV trail provided a welcome respite to the very steep first half of the hike. There is a cairn that marks the ideal entry point into the wooded area, which is just above the sheep trail that cuts south mentioned in the main description. 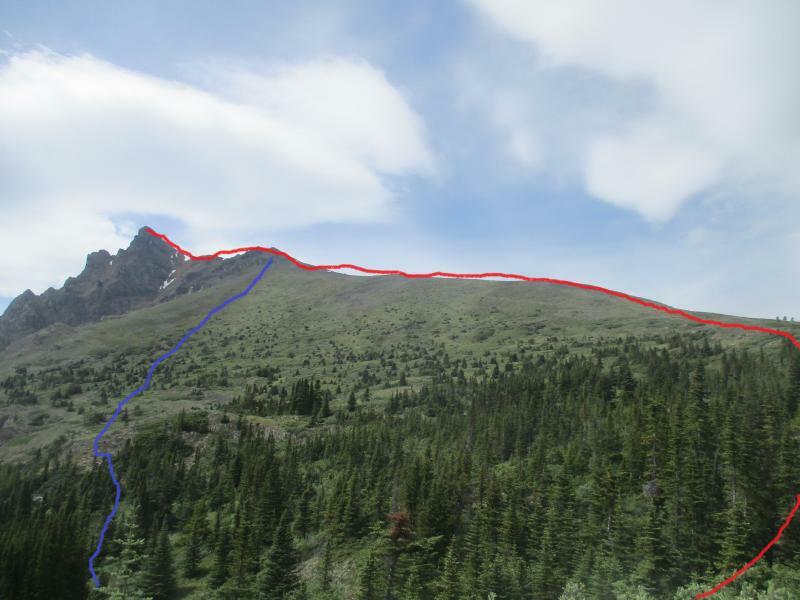 This can be helpful if you choose the steeper route because it's easy to miss that sheep trail when ascending. Plenty of goats and sheep at the top. I am curious where that ATV trail ends up. Highly recommended trail, but it's not easy or for anyone afraid of sheer heights. This was definitely the most challenging hike so far, but the most rewarding. I parked at the yellow gate (precisely 23.5 km after the Carcross bridge) at 9 am and was back at 3:30 pm after spending 1 hour on the summit. The trail described here was really accurate. You follow the defined old mining road for the first part and then you'll get to an obvious clearing. There's old mining stuff sitting around here. Make your way threw the clearing and the trail will start again (being less defined). From here, you make your way up the ridge for a LONG way. It is STEEP. There's not really a trail bringing you to the top, but you eventually figure it out by following the sheep trails. At a few spots, there'll be rocky sections and you can go around them to the right or you can just hike threw them if you want. Keep climbing up the ridge. There will always be the valley (or gulley) to your left. I never saw a trail intersecting my trail towards the left on my way up like described on here. However, I did see it on my way back down and it is shown here (the blue line). I don't see how taking this sheep trail is a good idea. I just made it all the way up the ridge until you reenter a forest area (you'll see the trees start to become taller again). This is where I took the picture. There are a few cairns to help you make your way in this dense forest area. At that point, stick to the right and you'll fall on an ATV trail (the red line) and you can follow it until you get to the base of the summit. It might add a little bit of distance, but you'll be happy to walk on a legit trail for the last bit. From there, just pick a spot and make your way up to the summit. Highly recommended. Awesome hike. No one has mentioned this, but as you climb up the ridge and get through the steepest parts (about 60% of the way up) there is an ATV trail. The trail swings wide to the right (north) but eventually can be followed towards the peak. It added a little bit of time to the hike but saved some stress on my legs. Hiked to summit on May 16 2015. Tough but hugely rewarding hike. Awesome 360 views from the top. About half way up we decided to bushwhack south through a gully and approach the summit from the east, avoiding the snow on the main north/south ridge. Solid snow pack at higher elevation. We chose to walk the north/south ridge on our descent and had a tough time holing through waist deep snow. Challenging to find your original trail on the way down so again we were forced to bushwhack through shrubs, snow and small pines. Saw a few goats at lower elevation. 5.5 hours up and about 3 hours down in tough conditions. 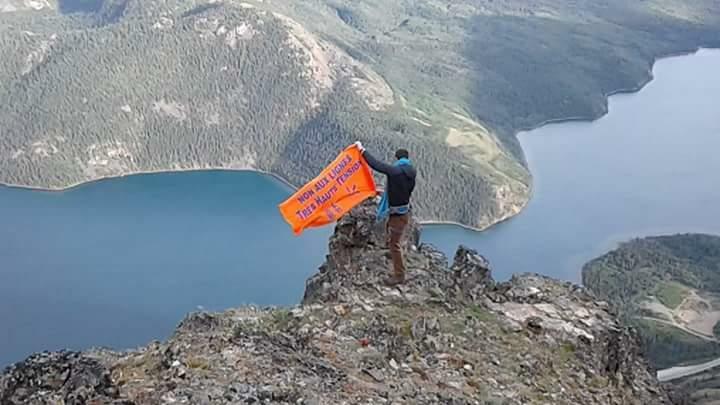 Hiked to summit May 9th 2015, Great hike with amazing views! Goats seen. Snow pack strong on ridge, post holing at lower elevations. Easily my favourite hike of the summer 2014 (So far)! - Bring A LOT of water in the summer. The view on the top is breathtaking. A full 360 degree panorama of beauty will unroll just before your eyes. I would say that an average hiker with a light day pack can do it in 5 hours round-trip. With a loaded backpack, it took me 5 hours way up and 2h30 way down. It *is* a hard hike. *Must* have good ankle support boots. The snowline was at the top of the plateau today, just before the top ridge. Snow pockets were up to 12 inches deep, but the average snow depth was only a couple of inches. There were a lot of goats on the surrounding ridges.